Professional tile and grout cleaning is the best way to make sure your tile and grout stay looking great for years to come. When choosing a professional tile and grout cleaning company, you want to make sure you’re choosing a company that can provide quality cleanings and fantastic customer service. KIWI Services in Heartland has spent 30 years cleaning tile and grout to perfection, and if you are looking for a company that is dedicated to providing the best cleaning for your tiles, look no further than KIWI. KIWI’s tile and grout cleaning services are Heartland’s top choice for a few reasons. With our professionally trained and highly skilled cleaning technicians that use state of the art tile and grout cleaning equipment it’s no wonder we have left over half a million customers happy. KIWI also offers a grout sealant that can be added on to keep your tile and grout looking great longer. KIWI works hard to not only provide quality tile cleanings, but quality customer service as well. KIWI’s representatives are ready to answer and all questions you may have. 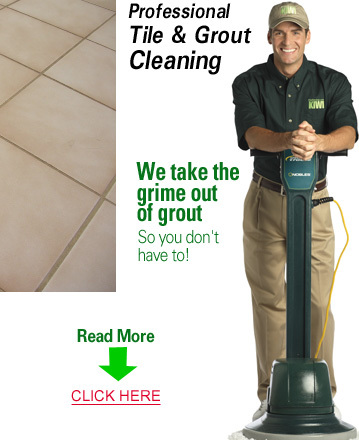 KIWI also offers a 30-day clean guarantee on all of our tile and grout cleaning services. If you should run into any problem with your tile and grout cleaning, give KIWI a call and we will come back out as soon as possible to perform a complimentary re-cleaning. We always want to make sure you are 100% satisfied with your cleaning from KIWI.